For the weblog software, see Movable Type. Around 1450, Johannes Gutenberg introduced the metal movable-type printing press in Europe, along with innovations in casting the type based on a matrix and hand mould. 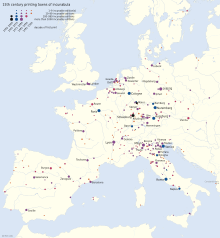 The small number of alphabetic characters needed for European languages was an important factor. Gutenberg was the first to create his type pieces from an alloy of lead, tin, and antimony—and these materials remained standard for 550 years. For alphabetic scripts, movable-type page setting was quicker than woodblock printing. The metal type pieces were more durable and the lettering was more uniform, leading to typography and fonts. The high quality and relatively low price of the Gutenberg Bible (1455) established the superiority of movable type in Europe and the use of printing presses spread rapidly. The printing press may be regarded as one of the key factors fostering the Renaissance and due to its effectiveness, its use spread around the globe. Movable type traces its origins to the punches used to make coins: the reverse face of a Tetradrachm Greek coin from Athens, 5th century BC, featuring various letters and the owl symbol of Athena. The technique of imprinting multiple copies of symbols or glyphs with a master type punch made of hard metal first developed around 3000 BC in ancient Sumer. These metal punch types can be seen as precursors of the letter punches adapted in later millennia to printing with movable metal type. Cylinder seals were used in Mesopotamia to create an impression on a surface by rolling the seal on wet clay. They were used to "sign" documents and mark objects as the owner's property. Cylinder seals were a related form of early typography capable of printing small page designs in relief (cameo) on wax or clay—a miniature forerunner of rotogravure printing used by wealthy individuals to seal and certify documents. By 650 BC the ancient Greeks were using larger diameter punches to imprint small page images onto coins and tokens. The designs of the artists who made the first coin punches were stylized with a degree of skill that could not be mistaken for common handiwork—salient and very specific types designed to be reproduced ad infinitum. Unlike the first typefaces used to print books in the 13th century, coin types were neither combined nor printed with ink on paper, but "published" in metal—a more durable medium—and survived in substantial numbers. As the portable face of ruling authority, coins were a compact form of standardized knowledge issued in large editions, an early mass medium that stabilized trade and civilization throughout the Mediterranean world of antiquity. Seals and stamps may have been precursors to movable type. The uneven spacing of the impressions on brick stamps found in the Mesopotamian cities of Uruk and Larsa, dating from the 2nd millennium BC, has been conjectured by some archaeologists as evidence that the stamps were made using movable type. The enigmatic Minoan Phaistos Disc of 1800–1600 BC has been considered by one scholar as an early example of a body of text being reproduced with reusable characters: it may have been produced by pressing pre-formed hieroglyphic "seals" into the soft clay. A few authors even view the disc as technically meeting all definitional criteria to represent an early incidence of movable-type printing. Recently it has been alleged by Jerome Eisenberg that the disk is a forgery. The Prüfening dedicatory inscription is medieval example of movable type stamps being used. Following the invention of paper in the 2nd century AD during the Chinese Han Dynasty, writing materials became more portable and economical than the bones, shells, bamboo slips, metal or stone tablets, silk, etc. previously used. Yet copying books by hand was still labour-consuming. Not until the Xiping Era (172–178 AD), towards the end of the Eastern Han Dynasty did sealing print and monotype appear. It was soon used for printing designs on fabrics, and later for printing texts. Woodblock printing, invented by about the 8th century during the Tang Dynasty, worked as follows. First, the neat hand-copied script was stuck on a relatively thick and smooth board, with the front of the paper, which was so thin that it was nearly transparent, sticking to the board, and characters showing in reverse, but distinctly, so that every stroke could be easily recognized. Then carvers cut away the parts of the board that were not part of the character, so that the characters were cut in relief, completely differently from those cut intaglio. When printing, the bulging characters would have some ink spread on them and be covered by paper. With workers' hands moving on the back of paper gently, characters would be printed on the paper. By the Song Dynasty, woodblock printing came to its heyday. Although woodblock printing played an influential role in spreading culture, there remained some apparent drawbacks. Firstly, carving the printing plate required considerable time, labour and materials; secondly, it was not convenient to store these plates; and finally, it was difficult to correct mistakes. In 1193, Zhou Bida, an officer of Southern Song Dynasty, made a set of clay movable-type method according to the method described by Shen Kuo in his Dream Pool Essays, and printed his book Notes of The Jade Hall (《玉堂雜記》). Bi Sheng (990–1051) also pioneered the use of wooden movable type around 1040 AD, as described by the Chinese scholar Shen Kuo (1031–1095). However, this technology was abandoned in favour of clay movable types due to the presence of wood grains and the unevenness of the wooden type after being soaked in ink. In 1298, Wang Zhen (王祯/王禎), a Yuan dynasty governmental official of Jingde County, Anhui Province, China, re-invented a method of making movable wooden types. He made more than 30,000 wooden movable types and printed 100 copies of Records of Jingde County (《旌德縣志》), a book of more than 60,000 Chinese characters. Soon afterwards, he summarized his invention in his book A method of making moveable wooden types for printing books. Although the wooden type was more durable under the mechanical rigors of handling, repeated printing wore the character faces down, and the types could only be replaced by carving new pieces. This system was later enhanced by pressing wooden blocks into sand and casting metal types from the depression in copper, bronze, iron or tin. This new method overcame many of the shortcomings of woodblock printing. Rather than manually carving an individual block to print a single page, movable type printing allowed for the quick assembly of a page of text. Furthermore, these new, more compact type fonts could be reused and stored. The set of wafer-like metal stamp types could be assembled to form pages, inked, and page impressions taken from rubbings on cloth or paper. In 1322，a Fenghua county officer Ma Chengde (馬称德) in Zhejiang, made 100,000 wooded movable types and printed the 43-volume Daxue Yanyi (《大學衍義》). Wooden movable types were used continually in China. Even as late as 1733, a 2300-volume Wuying Palace Collected Gems Edition (《武英殿聚珍版叢書》) was printed with 253,500 wooden movable types on order of the Qianlong Emperor, and completed in one year. A number of books printed in Tangut script during the Western Xia (1038–1227) period are known, of which the Auspicious Tantra of All-Reaching Union that was discovered in the ruins of Baisigou Square Pagoda in 1991 is believed to have been printed sometime during the reign of Emperor Renzong of Western Xia (1139–1193). It is considered by many Chinese experts to be the earliest extant example of a book printed using wooden movable type. The typical example of this kind of bronze movable type embedded copper-block printing is a printed "check" of the Jin Dynasty with two square holes for embedding two bronze movable-type characters, each selected from 1,000 different characters, such that each printed paper note has a different combination of markers. A copper-block printed note dated between 1215 and 1216 in the collection of Luo Zhenyu's Pictorial Paper Money of the Four Dynasties, 1914, shows two special characters – one called Ziliao, the other called Zihao – for the purpose of preventing counterfeiting; over the Ziliao there is a small character (輶) printed with movable copper type, while over the Zihao there is an empty square hole – apparently the associated copper metal type was lost. Another sample of Song dynasty money of the same period in the collection of the Shanghai Museum has two empty square holes above Ziliao as well as Zihou, due to the loss of the two copper movable types. Song dynasty bronze block embedded with bronze metal movable type printed paper money was issued on a large scale and remained in circulation for a long time. 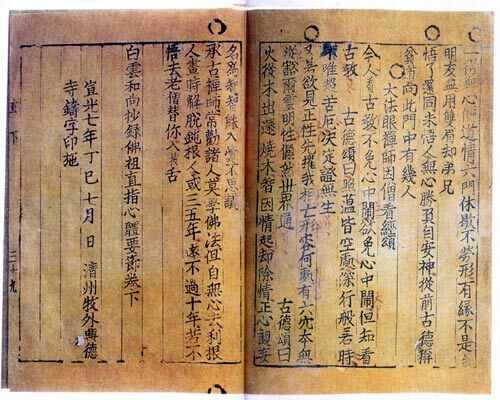 The 1298 book Zao Huozi Yinshufa (《造活字印书法》/《造活字印書法》) by the Yuan dynasty (1271–1368) official Wang Zhen mentions tin movable type, used probably since the Southern Song dynasty (1127–1279), but this was largely experimental. It was unsatisfactory due to its incompatibility with the inking process.:217. But by the late 15th century these concerns were resolved and bronze type was widely used in Chinese printing. During the Mongol Empire (1206–1405), printing using movable type spread from China to Central Asia. [clarification needed] The Uyghurs of Central Asia used movable type, their script type adopted from the Mongol language, some with Chinese words printed between the pages – strong evidence that the books were printed in China. During the Ming Dynasty (1368–1644), Hua Sui in 1490 used bronze type in printing books. :212 In 1574 the massive 1000-volume encyclopedia Imperial Readings of the Taiping Era (《太平御览》/《太平御覧》) was printed with bronze movable type. In 1725 the Qing Dynasty government made 250,000 bronze movable-type characters and printed 64 sets of the encyclopedic Gujin Tushu Jicheng (《古今图书集成》/《古今圖書集成》, Complete Collection of Illustrations and Writings from the Earliest to Current Times). Each set consisted of 5,040 volumes, making a total of 322,560 volumes printed using movable type. In 1234 the first books known to have been printed in metallic type set were published in Goryeo Dynasty Korea. They form a set of ritual books, Sangjeong Gogeum Yemun, compiled by Choe Yun-ui. While these books have not survived, the oldest book in the world printed in metallic movable types is Jikji, printed in Korea in 1377. The Asian Reading Room of the Library of Congress in Washington, D.C. displays examples of this metal type. Commenting on the invention of metallic types by Koreans, French scholar Henri-Jean Martin described this as "[extremely similar] to Gutenberg's". However, Korean movable metal type printing differed from European printing in the materials used for the type, punch, matrix, mould and in method of making an impression. At first, one cuts letters in beech wood. One fills a trough level with fine sandy [clay] of the reed-growing seashore. Wood-cut letters are pressed into the sand, then the impressions become negative and form letters [moulds]. At this step, placing one trough together with another, one pours the molten bronze down into an opening. The fluid flows in, filling these negative moulds, one by one becoming type. Lastly, one scrapes and files off the irregularities, and piles them up to be arranged. A potential solution to the linguistic and cultural bottleneck that held back movable type in Korea for 200 years appeared in the early 15th century—a generation before Gutenberg would begin working on his own movable-type invention in Europe—when Sejong the Great devised a simplified alphabet of 24 characters (hangul) for use by the common people, which could have made the typecasting and compositing process more feasible. But Korea's cultural elite, "appalled at the idea of losing hanja, the badge of their elitism", stifled the adoption of the new alphabet. 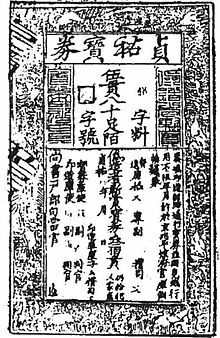 A "Confucian prohibition on the commercialization of printing" also obstructed the proliferation of movable type, restricting the distribution of books produced using the new method to the government. 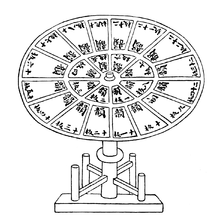 The technique was restricted to use by the royal foundry for official state publications only, where the focus was on reprinting Chinese classics lost in 1126 when Korea's libraries and palaces had perished in a conflict between dynasties. Scholarly debate and speculation has occurred as to whether Eastern movable type spread to Europe between the late 14th century and early 15th centuries. :58–69 For example,authoritative historians Frances Gies and Joseph Gies claimed that "The Asian priority of invention movable type is now firmly established, and that Chinese-Korean technique, or a report of it traveled westward is almost certain." However, Joseph P.McDermott claimed that "No text indicates the presence or knowledge of any kind of Asian movable type or movable type imprint in Europe before 1450. The material evidence is even more conclusive." The Printing Revolution in the 15th century: Within several decades around 270 European towns took up movable-type printing. Johannes Gutenberg of Mainz, Germany is acknowledged[by whom?] as the first to invent a metal movable-type printing system in Europe: the printing press. Gutenberg, as a goldsmith, knew techniques of cutting punches for making coins from moulds. 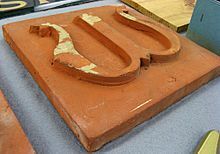 Between 1436 and 1450 he developed hardware and techniques for casting letters from matrices using a device called the hand mould. Gutenberg's key invention and contribution to movable-type printing in Europe, the hand mould, was the first practical means of making cheap copies of letterpunches in the vast quantities needed to print complete books, making the movable-type printing process a viable enterprise. Before Gutenberg, scribes copied books by hand on scrolls and paper, or print-makers printed texts from hand-carved wooden blocks. Either process took a long time; even a small book could take months to complete. Because carved letters or blocks were flimsy and the wood susceptible to ink, the blocks had a limited lifespan. It has also been suggested[by whom?] that the method used by Gutenberg involved using a single punch to make a mould, but the mould was such that the process of taking the type out disturbed the casting, causing variants and anomalies, and that the punch-matrix system came into use possibly around the 1470s. This raises the possibility that the development of movable type in the West may have been progressive rather than a single innovation. 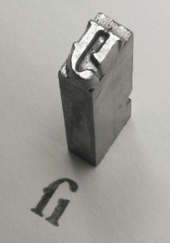 A piece of cast metal type, Garamond style long s i ligature. See also: Sort. If the glyph design includes enclosed spaces (counters) then a counterpunch is made. The counter shapes are transferred in relief (cameo) onto the end of a rectangular bar of mild steel using a specialized engraving tool called a graver. The finished counterpunch is hardened by heating and quenching (tempering), or exposure to a cyanide solution (case hardening). The counterpunch is then struck against the end of a similar rectangular steel bar—the letterpunch—to impress the counter shapes as recessed spaces (intaglio). The outer profile of the glyph is completed by scraping away with a graver the material outside the counter spaces, leaving only the stroke or lines of the glyph. Progress toward the finished design is checked by successive smoke proofs; temporary prints made from a thin coating of carbon deposited on the punch surface by a candle flame. The finished letter punch is finally hardened to withstand the rigors of reproduction by striking. One counterpunch and one letterpunch are produced for every letter or glyph making up a complete font. The letterpunch is used to strike a blank die of soft metal to make a negative letter mould, called a matrix. The matrix is inserted into the bottom of a device called a hand mould. The mould is clamped shut and molten type metal alloy consisting mostly of lead and tin, with a small amount of antimony for hardening, is poured into a cavity from the top. Antimony has the rare property of expanding as it cools, giving the casting sharp edges. When the type metal has sufficiently cooled, the mould is unlocked and a rectangular block approximately 4 centimeters long, called a sort, is extracted. 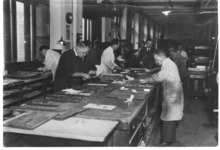 Excess casting on the end of the sort, called the tang, is later removed to make the sort the precise height required for printing, known as "type height". 0.918 inches (23.3 mm) : United Kingdom, Canada, U.S. Tiny differences in type-height will cause quite bold images of characters. At the end of the 19th century there were only two typefoundries left in the Netherlands: Johan Enschedé & Zonen, at Haarlem, and Lettergieterij Amsterdam, voorheen Tetterode. They both had their own type-height: Enschedé: 65 23/24 points Didot, and Amsterdam: 66 1/24 points Didot. Enough difference to prevent a combined use of fonts of both typefoundries: Enschede would be to light, or otherwise the Amsterdam-font would print rather bold. A perfect way of binding clients. In 1905 the Dutch governmental "Algemeene Landsdrukkerij", later: "State-printery" (Staatsdrukkerij) decided during a reorganisation to use a standard type-height of 63 points Didot. "Staatsdrukkerij-hoogte", actually Belgium-height, but this fact was not widely known. Traditionally, the capital letters were stored in a separate drawer or case that was located above the case that held the other letters; this is why capital letters are called "upper case" characters while the non-capitals are "lower case". Compartments also held spacers, which are blocks of blank type used to separate words and fill out a line of type, such as em and en quads (quadrats, or spaces. A quadrat is a block of type whose face is lower than the printing letters so that it does not itself print.). An em space was the width of a capital letter "M" – as wide as it was high – while an en space referred to a space half the width of its height (usually the dimensions for a capital "N"). Individual letters are assembled into words and lines of text with the aid of a composing stick, and the whole assembly is tightly bound together to make up a page image called a forme, where all letter faces are exactly the same height to form a flat surface of type. The forme is mounted on a printing press, a thin coating of viscous ink is applied and impressions made on paper under great pressure in the press. "Sorts" is the term given to special characters not freely available in the typical type case, such as the "@" mark. Ceramic type from the collections of University of Reading. Sometimes it is erroneously stated that printing with metal type replaced the earlier methods. In the industrial era printing methods would be chosen to suit the purpose. For example, when printing large scale letters in posters etc. the metal type would have proved too heavy and economically unviable. Thus, large scale type was made as carved wood blocks as well as ceramics plates. Also in many cases where large scale text was required, it was simpler to hand the job to a sign painter than a printer. Images could be printed together with movable type if they were made as woodcuts or wood engravings as long as the blocks were made to the same type height. If intaglio methods, such as copper plates, were used for the images, then images and the text would have required separate print runs on different machines. ^ a b c von Polenz, Peter (1991). Deutsche Sprachgeschichte vom Spätmittelalter bis zur Gegenwart: I. Einführung, Grundbegriffe, Deutsch in der frühbürgerlichen Zeit (in German). New York/Berlin: Walter de Gruyter GmbH. ^ He, Zhou (1994). 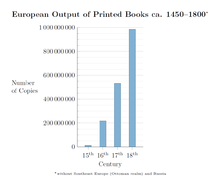 "Diffusion of Movable Type in China and Europe: Why Were There Two Fates?". International Communication Gazette. 53 (3): 153–173. doi:10.1177/001654929405300301. ^ Beckwith, Christopher I. (2009). Empires of the Silk Road: A History of Central Eurasia from the Bronze Age to the Present. Princeton University Press. ISBN 978-0-691-15034-5. ^ Clair, Kate; Busic-Snyder, Cynthia (2012). A Typographic Workbook: A Primer to History, Techniques, and Artistry. John Wiley & Sons. p. 4. ISBN 978-1-118-39988-0. ^ Hogan, C. Michael (29 December 2007). "Knossos Fieldnotes". The Modern Antiquarian. Retrieved 2012-08-15. ^ Alberge, Dalya (2008-07-12). "Phaistos Disc declared as fake by scholar". Times Online. Retrieved 2008-09-01. ^ a b c d e f g Tsien, Tsuen-Hsuin (1985). Paper and Printing. Needham, Joseph Science and Civilization in China. vol. 5 part 1. Cambridge University Press. pp. 201–217. ISBN 978-0-521-08690-5. ; also published in Taipei: Caves Books, Ltd., 1986. ^ a b c d Man, John (2002). The Gutenberg Revolution: The story of a genius that changed the world. London: Headline Book Publishing. ISBN 978-0-7472-4504-9. A detailed examination of Gutenberg's life and invention, interwoven with the underlying social and religious upheaval of Medieval Europe on the eve of the Renaissance. ^ Sohn, Pow-Key (1959). "Early Korean Printing". Journal of the American Oriental Society. 79 (2): 96–103. doi:10.2307/595851. JSTOR 595851. ^ Shen Kuo. Dream Pool Essays. ^ Zhang Yuzhen (張玉珍) (2003). "世界上現存最早的木活字印本—宁夏贺兰山方塔出土西夏文佛經《吉祥遍至口和本讀》介紹" [The world's oldest extant book printed with wooden movable type]. Library and Information (《書與情报》) (1). ISSN 1003-6938. Archived from the original on 2012-04-02. ^ Hou Jianmei (侯健美); Tong Shuquan (童曙泉) (20 December 2004). "《大夏寻踪》今展國博" ['In the Footsteps of the Great Xia' now exhibiting at the National Museum]. Beijing Daily (《北京日报》). ^ Tsien, Tsuen-Hsuin (1985). Paper and Printing. Needham, Joseph Science and Civilization in China. vol. 5 part 1. Cambridge University Press. p. 211. ISBN 978-0-521-08690-5. ^ a b c Thomas Christensen (2007). "Did East Asian Printing Traditions Influence the European Renaissance?". Arts of Asia Magazine (to appear). Retrieved 2006-10-18. ^ Sohn, Pow-Key (Summer 1993). "Printing Since the 8th Century in Korea". Koreana. 7 (2): 4–9. ^ Twyman, Michael (1998). The British Library Guide to Printing: History and Techniques. London: The British Library. p. 21. ISBN 9780802081797. ^ World Treasures of the Library of Congress. Retrieved 26 December 2006. ^ a b McDermott, Joseph P., ed. (2015). The Book Worlds of East Asia and Europe, 1450–1850: Connections and Comparisons. Hong Kong University Press. pp. 25–26. ISBN 978-988-8208-08-1. ^ Buringh, Eltjo; van Zanden, Jan Luiten (2009). "Charting the 'Rise of the West': Manuscripts and Printed Books in Europe, A Long-Term Perspective from the Sixth through Eighteenth Centuries". The Journal of Economic History. 69 (2): 409–445. doi:10.1017/S0022050709000837. JSTOR 40263962p. 417, table 2. ^ Agüera y Arcas, Blaise; Paul Needham (November 2002). "Computational analytical bibliography". Proceedings Bibliopolis Conference The future history of the book. The Hague (Netherlands): Koninklijke Bibliotheek. ^ Adams, James L. (1993). Flying Buttresses, Entropy and O-Rings: the World of an Engineer. Harvard University Press. p. 80. ISBN 9780674306899. There are printed materials from Holland that supposedly predate the Mainz shop. Early work on movable type in France was also under way. ^ "Machine Composition and Type Metal". ^ "Answers.com page on antimony". McGraw-Hill Encyclopedia of Science and Technology. McGraw-Hill. 2005-01-01. Retrieved 2009-06-30. ^ Meggs, Philip B., Purvis, Alston W. "Graphic Design and the Industrial Revolution" History of Graphic Design. Hoboken, N.J: Wiley, 2006. p. 139. Moxon, Joseph (1683–84). "Mechanick Exercises on the Whole Art of Printing" (ed. Herbert Davies & Harry Carter. New York: Dover Publications, 1962, reprint ed. ).